Apple's iPad has been cleared for use by American Airlines pilots during takeoff and landing in a move that could make bulky flight bags crammed with manuals and charts a thing of the past. American Airlines began testing iPads as "electronic flight bags" last year and a number of other carriers, including United Airlines and Alaska Airlines, have followed suit. But pilots were barred from using the touchscreen tablet computers during "critical phases of flight" -- operations below 10,000 feet (3048 metres) -- pending further evaluation. Les Dorr, a Federal Aviation Administration spokesman, said American Airlines received authorization from the FAA on December 1 to use the iPad in the cockpit during all phases of flight, including takeoff and landing. "American Airlines is the first major air carrier to get approval for operational use of the iPad as an electronic flight bag," Dorr said, adding that the authorisation followed an evaluation period of around six months. "During that period they have to show that it doesn't interfere with crew duties and especially that it does not interfere with the communication and navigation systems of the aircraft," Dorr said. For the moment, use of the iPad during all phases of flight is restricted to American Airlines pilots flying the twin-engine Boeing 777. Hank Putek, an American Airlines captain who serves on the safety committee of the Allied Pilots Association, welcomed the FAA move and described the iPad as a "real safety enhancer" on the flight deck. "There's a significant improvement in situational awareness," Putek said. "The ability to have a backlit screen with a map on it that can be panned and zoomed really significantly increases the safety aspect of taxiing an airliner on the ground," he said. "The same goes for when you're flying an instrument approach in bad weather," he said. "You have the approach chart on the iPad and you can zoom and pan and scroll to your exact location in the air while you're flying the approach." Putek said replacing the hefty flight bags, which can weigh 15.9 kilogramsor more, with the 0.7kg iPad would help save fuel but the "primary purpose is to improve safety on the flight deck." Passengers on US airlines are required to turn off electronic devices during takeoff and landing -- a regulation which recently saw actor Alec Baldwin booted off an American Airlines flight for refusing to turn off his cellphone. 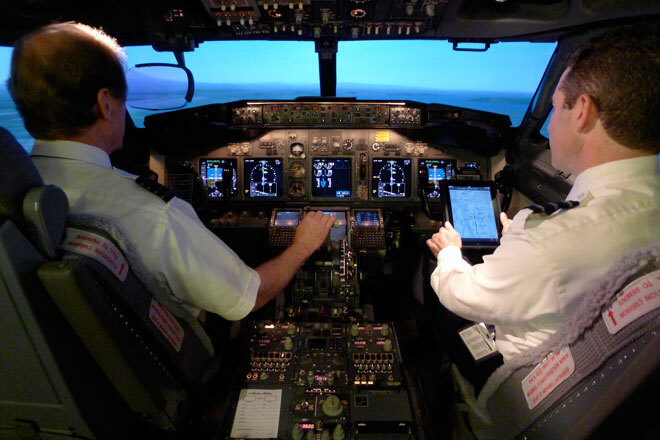 The requirement will not apply to iPads being used in the cockpit because Wi-Fi and cellular connectivity are turned off, eliminating the possibility of interference with aircraft navigation systems. Dorr, the FAA spokesman, said he expects other major US airlines to seek approval for expanded use of the iPad on the flight deck. "It's fair to say that you will probably see more major carriers asking for this," he said. "The iPad seems to be the hot device for an electronic flight bag at the moment."